Libya - The UN Migration Agency (IOM) has completed the rehabilitation of 18 water wells in 12 out of 14 neighbourhoods of the Libyan city of Sabha. Those neighborhoods are: Manshiya, Mashroo’, Hajara, Aljadeed, Almahdiya, Abdelkafi, Althanawiya, Sukara, Gurda, Tyori, Nasriya, and Junga. The project, part of the IOM Community Stabilization programme “Together We Rebuild”, included the provision of new electrical pumps for wells to allow the restoration of a domestic water supply. The rehabilitation was accomplished with funding from the European Union. The UN Migration Agency contracted two local enterprises from Sabha. Activity was closely coordinated and supported by local authorities, in particular the Water and Waste Company in Sabha, the owner of the water wells. The implementation of this project comes at a critical time when the city of Sabha has been suffering from an ongoing water crisis, which is particularly critical during the summer season when water consumption increases. 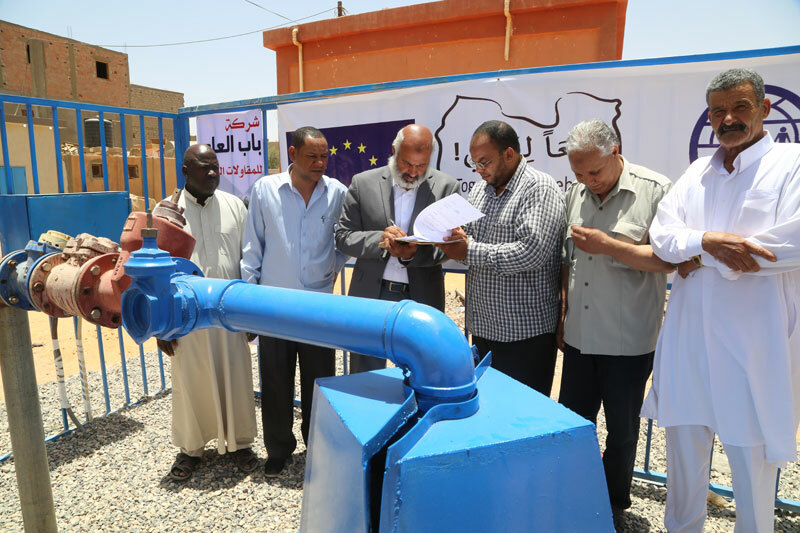 “We highly appreciate the support of the EU and the efforts made by IOM in rehabilitating 18 water wells in Sabha city which has been suffering from serious water shortages. This support comes at a critical time when the Water and Waste Water Company is in need of such support to help us maintain this essential service to the people of the city,” explained engineer Mohammad Aboul-Qassem Yaqa, the Head of Works and Maintenance Department at the Water and Waste Water Company. Libya’s Minister of Local Government, Badad Ganaso Abdul Jaleel, added: "The Ministry of Local Government of the Government of National Accord supports IOM initiatives to promote community stabilization in the south of Libya. We are confident that the people of Sabha and the south in general urgently need these important projects, especially in these difficult times." The identification of the necessity for the rehabilitation of water wells came as the result of a series of community meetings conducted by the Community Management Committee (CMC), which was formed by IOM and includes influential representatives from various tribes and social figures of the city. The CMC met with the community members in the various neighbourhoods, all of whom identified the rehabilitation of the water wells as their communities’ top priority. “The EU will continue supporting, through similar local initiatives, the economic and political stabilization of the south of the country,” added Ambassador Muscheidt. “IOM thanks the Ministry of Local Government, the EU, the local municipality and the CMC for their continuous support as this project will facilitate access to water for thousands of people. We will continue to address the most urgent needs identified by the communities,” concluded IOM Libya Chief of Mission Othman Belbeisi.